This year, marketers in Western Europe will invest over $35 billion in digital advertising. Growth will be comparatively sluggish in most countries, however, due to market maturity and persistent political and economic concerns in the region. Western Europe is the world’s third largest advertising market, worth nearly $100 billion in 2016, eMarketer estimates. More than 35% of that total will go to digital ads, though growth overall will be slower compared with other regions. 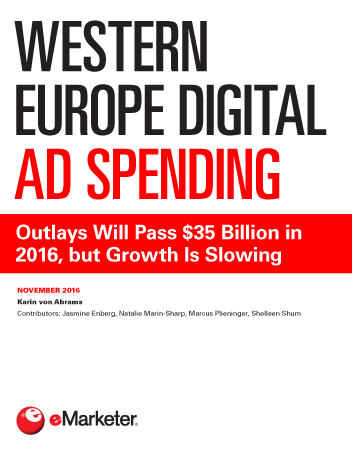 Digital ad spending still varies enormously across the EU-5. Outlays in the UK will be more than twice of those in Germany. Meanwhile, spending in Germany will be more than twice the level estimated in France. Italy and Spain will continue to lag by this measure. Search remains vital for Western Europe’s advertisers, and it will account for nearly $16.5 billion this year—the single biggest chunk of digital ad spending in the region. Italy is the only EU-5 nation where display has historically claimed more dollars than search. Display is gradually gaining share in most markets in Western Europe, as brands boost their investments in video and mobile display formats in particular. Outlays on mobile internet ads in the region will rise nearly 45% in 2016 and pass $16.5 billion. That sum will more than double by 2020. "Expenditure on digital advertising in Western Europe will pass $35 billion in 2016 and $40 billion in 2018. Annual growth rates in this mature market will be less than 10%, however—well below the global average."